The most successful fundraising events are those that have sponsors. Sponsors are businesses and individuals that contribute a certain amount of money to help underwrite the costs of the fundraising event. In exchange for this support, the sponsor receives certain types of recognition associated with the fund raising event. There are a number of key strategies that should be considered when seeking sponsors for a fundraising event. At the heart of reaching out to a potential sponsor is crafting a written solicitation letter. This letter is a concise statement that sets out the essential elements of the events and the benefits of being a sponsor. As a general rule, the best written solicitations associated with recruiting a sponsor for a fundraising event are limited to between three to five well-written paragraphs. The reality is that those individuals who make the decisions about coming on board as an event sponsor simply do not have a great deal of time to review voluminous information. These letters should outline information about your event, your organization and its mission, and what you plan to use the raised funds for. Story sharing, in a concise way, is essential in tugging on the heartstrings of potential sponsors. Another name for a person who believes in your cause is a supporter, and supporters more often than not turn into donors. Check out our post on Solicitation Letters for a step-by-step breakdown of writing an effective letter. Sponsorship solicitations should always be done in person, and whenever possible through a mutual contact. This method typically yields the best results. After you have asked for a company to join your team as a sponsor, be sure to leave behind your letter. You want them to have something to go back to, or to show others within their company. A common problem associated with soliciting a sponsor or sponsors associated with a fundraising event is failing to be proactive in the process of seeking this type of support. In other words, time and again, organizers of fundraising events wait until the proverbial last minute to begin seeking out and pitching potential sponsors. Ideally, the organizers of a fundraising event begin the process of seeking sponsors eight to 10 weeks before the scheduled date of the event (even earlier for large scale events). This gives organizers enough time to identify potential sponsors, pitch them and give these businesses and individuals time to contemplate playing a role in an event. It also allows for pre-event advertising for larger sponsors. An important strategy to utilize in solicitation sponsorship for a fundraising event is the creation and development of a sponsorship solicitation team. By creating a team, rather than relying on one person, a wide range of different avenues will open up. A solicitation team also better ensures that the whole process of obtaining sponsorship support remains on target and apace. This occurs because of multiple people responsible for the various campaign tasks and also the support and encouragement garnered in a team setting. 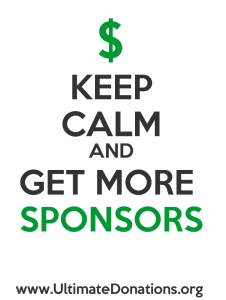 No matter what, just make sure you don’t underestimate the importance of getting sponsorships. They can be the thing that turns your good fundraiser into a great one! August 21, 2015 February 24, 2016 Comments Off! November 26, 2015 February 18, 2017 Comments Off! November 2, 2015 March 6, 2017 Comments Off! March 22, 2016 February 18, 2017 Comments Off!